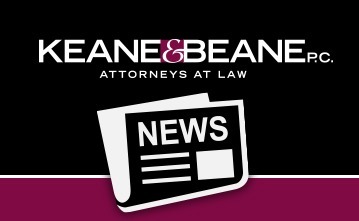 Firm News Archives - Keane & Beane P.C. Keane & Beane’s Office Manager, Barbara Durkin, Celebrates 38 Years of Dedication! On June 3, 2015, Patrick J. O’Sullivan was installed as Secretary of Estate Planning Council of Westchester County. Richard L. O’Rourke Named to the Board of Directors of the Westchester County Bar Foundation, Inc.
Christopher Aventuro Becomes Member of Keane & Beane, P.C. Happy Holidays from Keane & Beane, P.C. Keane & Beane Celebrates 30 Years!